Includes: Custom 12-month license key, HTML file for using calculator locally on your computer, ability to customize the stretch-out report, website code and instructions to add calculator to your website, and complete Instructions for Use. Automatic annual renewal fee of $99. Includes: Custom 12-month license key, HTML file for using calculator locally on your computer, ability to customize the stretch-out report, website code and instructions to add calculator to your website, and complete Instructions for Use. The Ultimate IRA Inheritance Calculator™ & Stretch-Out Report was developed originally by estate planning attorney Brenda Geiger, J.D. in order to help her clients better understand the opportunity of the stretch-out of their IRAs and other qualified retirement plans to benefit their children. The calculator provides an easy to read report that shows the stretch for multiple beneficiaries inheriting an IRA or other qualified plan as the eventual beneficiaries after the death of the original owner and his or her spouse. The calculator also provides a summary of the anticipated total RMDs that the original owner will be required to withdraw for the account during their lifetime and the total combined RMDs the non-spousal beneficiaries will need to withdraw by age 85. The calculations provided by this application has been reviewed and verified by multiple experts in the industry, including nationally renowned CPA, Robert S. Keebler. Check this video out from Brenda! The calculator is operated through an online application developed, managed and maintained by Brenda Geiger. When you purchase the calculator, you will be assigned a custom license key. Once you have been assigned a license key, you will be e-mailed a file to keep on your local computer to run the calculator and generate the stretch-out report. You will also be given instructions on how to use the calculator, how to customize the report, and how to access the instructions to be able to add the calculator to your website. Clients are constantly telling me not to bother doing any planning with their IRAs and 401(k)s because they plan on using up their retirement. 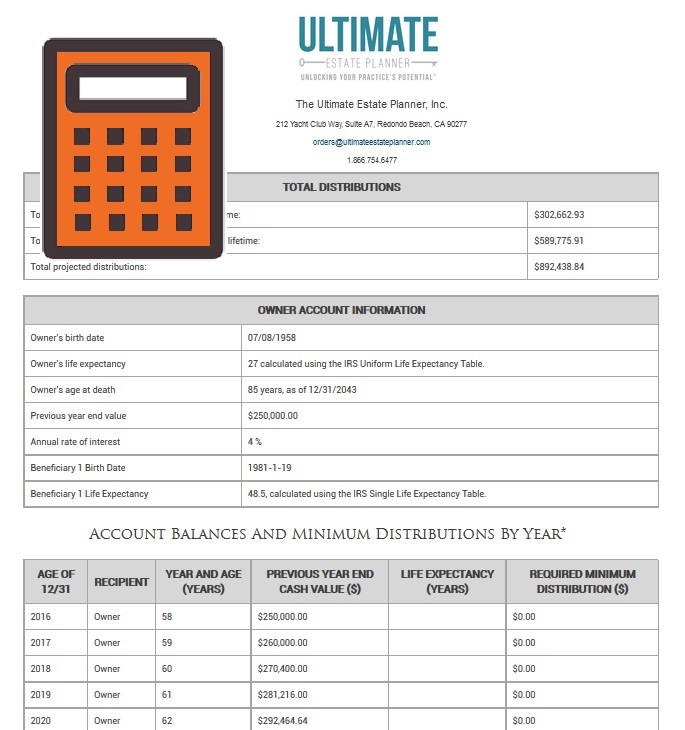 However, with The Ultimate IRA Inheritance Calculator™ & Stretchout Report, I have been able to show client after client how valuable these assets can be and how likely they are to grow. The calculator is easy-to-use and, most importantly, it generates the numbers and client-friendly reports that are very persuasive and it gets clients do something that they should be–using an inherited IRA Trust to stretch-out and protect their IRA assets for their heirs. Try it. It’s fantastic and a must-have for anyone drafting IRA Trusts! Would you like to preview how the calculator works and what the stretchout report looks like? You can! Click the “View Demo” button below to test-drive this calculator before purchasing it! Your purchase of a 12-month license to The Ultimate IRA Inheritance Calculator™ & Stretch-Out Report includes an automatic 12-month renewal subscription. Your credit card will be charged one calendar year following the date of purchase. If you should wish to cancel your license, you must submit a request to us (in writing) to orders@ultimateestateplanner.com. If, for any reason, you are dissatisfied with The Ultimate IRA Inheritance Calculator™ & Stretch-Out Report, you can submit a request in writing to us to return the product. However, due to the nature of this particular product, no monetary refunds will be processed. Any product returns will only be processed in the form of credit with The Ultimate Estate Planner, Inc. towards a future purchase. If you have any questions or wish to return this product, please contact us by e-mail at orders@ultimateestateplanner.com.